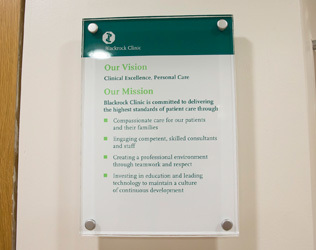 Patient safety underscores every activity at Blackrock Clinic. While this was always a crucial part of the Clinic’s operation, patient safety is now under the guidance of a Clinical Governance Director, Professor Gregor Shanik who was appointed 3 years ago. The role is executed in close association with Edel Costigan (Quality Manager) and Joanne Flanagan (Clinical Nurse Specialist in Infection Prevention and Control), and dovetails with the existing Clinical Governance Committee. Professor Shanik’s appointment is believed to be the first Clinical Governance Director with the sole remit of Clinical Governance in a hospital in Ireland. He reports directly to the Board of Blackrock Clinic.